Injera, is an Ethiopian flatbread, “Ethiopian pancake”, which is served with almost all traditional recipes from Ethiopia. It is considered the number one staple food of Ethiopia and is used to serve the delicious Ethiopian dishes. One can buy premade Injera in the freezers of some stores, but the best taste you will get by making this delicious Ethiopian food yourself. 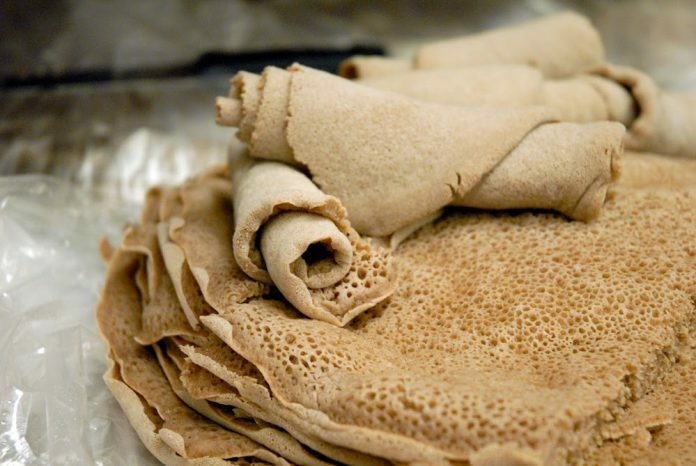 Injera is traditionally made from teff flour which is a finely ground flour made from the grains of Teff, However very fine millet flour, which might be easier to get in your local may also be used to make this delicious Ethiopian pancake, the Injera flatbread. When making Injera take into account that the best results for a homemade injera is to let the dough ferment for at least a day or two. If you can’t wait this long you can add warm water instead of cold to fasten up the process. Put 375 gram of the flour in a bowl and the glass of water and yeast to it. Pour the remaining flour (125 gram) in another bowl. Boil 150ml of water and pour over the flour. Mix and let it stand 5 minutes. Now mix the dough of the previous day together with 165ml of cold water with the dough of today. Heat a nonstick griddle or large frying pan and pour a ladle of batter to form a very thin layer in the pan or on the griddle. Cover the pan or griddle when the first bubbles start to appear and cook for about 5 minutes. Now your Injera is ready and you can serve your delicious Ethiopian, Eritrean or Somalian food on your own homemade Injera.